Several species of birds are commonly referred to as roosting birds. Included among these in Indiana are the blackbirds, starlings and grackles, as well as crows and vultures. These birds flock together during fall, winter and early spring, often forming huge roosts in urban areas. Their presence is often problematic because of potential health, economic and nuisance problems. 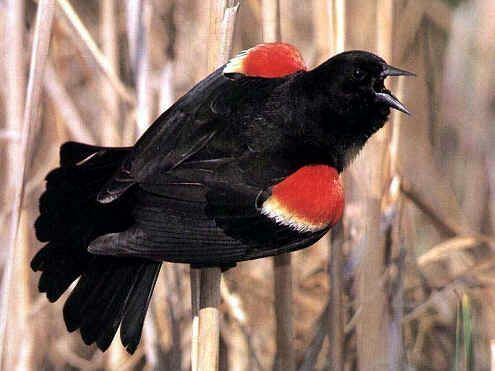 These large blackbirds are characterized by long, keel-shaped tails and yellow eyes. Male grackles often appear iridescent purple. They are about the size of a small crow and are very common in Indiana. 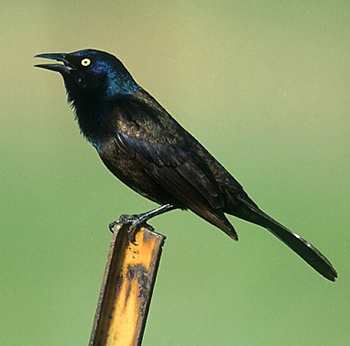 Grackles are frequently seen feeding in fields, lawns, golf courses and orchards. They nest wherever there is adequate cover such as trees in parks, yards, woodlots, orchards and marshes. Grackles are omnivorous, which means they feed on a variety of plant and animal matter. Insects make up the bulk of their diet during the spring and summer months, while grain, grass seeds, pet food and fruits provide food during the fall and winter. Individual grackles normally do not pose much of a problem; however, when they flock together and roost in trees near homes, parks or other public facilities, they can often pose a public health hazard or nuisance. Several diseases, particularly the respiratory ailment histoplasmosis, are indirectly transmissible from birds to humans. Many of these diseases are spread from the accumulation of bird droppings under the roost site. The droppings also will damage the finish on cars and kill grass and other ornamental plants. Grackles are noisy birds, often making a disturbing and obnoxious racket. Grackles may consume or destroy farm crops such as citrus, tomatoes, watermelons, cabbage, lettuce, grain, corn, peaches, figs and cantaloupes. Starlings are smaller than grackles (about the size of a robin) and have short, square tails. During the winter, adult starlings are speckled with light dots, but they become more iridescent and less speckled during the breeding season. Juvenile starlings are a dusky, gray color. 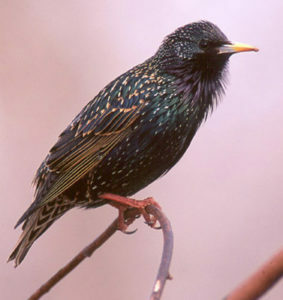 Starlings were introduced into New York from Europe in the late 1800s and have since spread across the entire country. They are common in urban and suburban areas and nest in any suitable hole or cavity in bird houses, buildings and trees. Like grackles, starlings eat a variety of foods, but prefer seeds and fruits. They also will feed on insects during the spring and summer when insects are numerous. Like grackles, starlings tend to congregate and roost together in flocks. Starling roosts in urban or residential areas can be a source of disease. Starlings also can cause a considerable amount of damage to gardens and orchard crops such as grapes, strawberries, apples and cherries. They are aggressive birds and often drive away desirable song birds. They may nest in bird houses intended for purple martins, woodpeckers or bluebirds. Blackbirds and cowbirds also will flock together in huge roosts. The diseases and damage that they can cause are similar to those caused by grackles and starlings; therefore, their presence in urban areas is often objectionable. Female cowbirds lay their eggs in the nests of other birds. As a result, the host bird raises the cowbird young often at the expense of their own young. American Crows are the only crow native to Indiana. It is the largest of all the crow species, and while it resembles the common raven, its bill is noticeably smaller, and it lacks the shaggy throat feathers of the raven. Crows are very social and roost together in extended family groups at night during the fall and winter. They will range several miles during the day in search of food, returning to the roost at night. 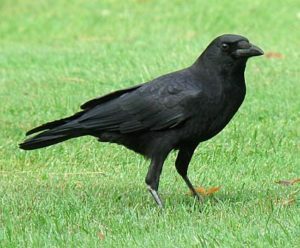 In addition to roosts where resident numbers may extend into the thousands, creating problems common with other types of roosting birds, American crows are known to cause extensive damage to agricultural crops and natural resources, including predation of the young of other bird species. Indiana is home to a large population of turkey vultures, as well as a few localized populations of black vultures. Turkey vultures are larger, with up to a six foot wingspan, and a very noticeable featherless pink head. They are easily spotted from the ground by their two-tone wing feathers and their distinctive flight. Turkey vultures hold their wings in a slight V-shape, rocking from side to side as they glide, rarely flapping their wings. They are social, found frequently in extended family groups from late summer through winter. Black vultures are fairly uncommon in Indiana, keeping mostly to the southern tier of the state. Easily discernable from the turkey vultures, they can be noted from the ground by their shorter wingspan and heavier flight pattern, as well as a black or gray featherless head. Black vultures are more aggressive than their counterparts, and while turkey vultures tend to be solitary hunters during the warmer months, black vultures often travel in large groups at all times during the year. 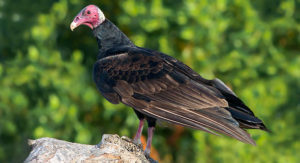 Damage by turkey vultures is generally limited in scope, and is commonly reported as birds roosting in trees or on large utility structures or communication towers. Rarely, the birds will pick at shingles and other roofing materials. The most frequent conflict comes from the mess that turkey vultures leave behind at a chosen roost in the form of droppings and regurgitations. Black vultures tend to be more commonly associated with predation on young livestock, and are very difficult to disperse. Flocks of vultures will attack young animals that are only hours or days old. Several things can be done to discourage roosting birds. It is important to begin control measures as soon as it is evident that the birds are beginning to form a roost, because it is very difficult to displace the birds after the roost has been well established. The use of frightening devices has proved to be the most successful method of dispersing bird roosts. Persistence and proper timing are essential. The majority of the birds will arrive at the roost about an hour before sunset each day so persons involved in the activity should be in position and ready before the first birds start to arrive. Frightening methods should begin when the first birds start to arrive and continue until dark. This procedure should continue for several evenings in a row, or until all of the birds have been moved. Most frightening devices scare the birds away with loud noises. Since most cities have ordinances against noise-making devices, check with the police department for current regulations before using them. Neighbors near the roost site also should be notified. These devices are 12-gauge shotgun shells that contain firecrackers. When discharged, the firecrackers are launched about 200 feet into the air before they explode. The shells should be fired so that they will explode underneath or in front of the flock of birds approaching the roost. The purpose is to produce an explosion between the birds and the roost. The last few minutes before dark, when the birds are still moving, is a critical period when the most firepower is needed. These devices are fired from a 15mm flare pistol. Noise bombs are firecrackers that travel about 75 feet before exploding. They should be used in the same way as the shell crackers. Whistle bombs are similar to noise bombs but do not explode. In addition to their whistling sound, they produce a trail of smoke and fire which can be well seen just before dark. Racket bombs make noise in flight but do not explode. Distress and alarm calls of starlings and blackbirds have been used alone and in conjunction with other frightening devices to successfully move bird roosts. These tapes are available from many sporting good stores. The calls can be played on a standard cassette tape recorder, but the use of large speakers will make the sounds more effective. The tapes should be played as the birds attempt to enter the roost and should remain on for as long as the birds are in the vicinity. Propane exploders, air horns and other loud noise-making devices can be effective in dispersing roosting birds. Like other methods, they should be used from the time the first birds arrive until dark. Flashing lights, streams of water sprayed at the roost, hawk or owl decoys, and helium-filled balloons all have been used as frightening devices. Their effectiveness is enhanced when they are used along with auditory devices. Decoys or effigies can be used on vulture roosts to discourage congregating. Thinning roost vegetation to make it less attractive to birds often produces longer lasting results than using scaring devices. When possible, thin the roost vegetation after the birds are dispersed to discourage their return. Thinning the vegetation one time, however, is not a permanent solution to the problem. A regular vegetation maintenance program must be established. Brown-headed cowbirds, common grackles, red-winged blackbirds, rusty blackbirds, Brewer’s blackbirds, and crows may be taken (killed) if the birds: are committing or about to commit depredations upon ornamental or shade trees, agricultural crops, livestock, or wildlife; or are concentrated in numbers and in a manner which constitutes a health hazard or nuisance. Individuals with nuisance wild animal control permits can assist homeowners with nuisance roosting birds. The names of licensed nuisance wild animal control operators and additional information can be obtained from the Indiana Wildlife Conflicts Information Hotline at 1-877-463-6367.